Jungle Safari at Shuklaphanta National Park, Nepal: Worth A Visit? Home | Jungle Safari at Shuklaphanta National Park, Nepal: Worth A Visit? Is Shuklaphanta National Park worth a visit in Nepal? Read my jungle safari experience and decide whether you should add it to your itinerary or skip it. 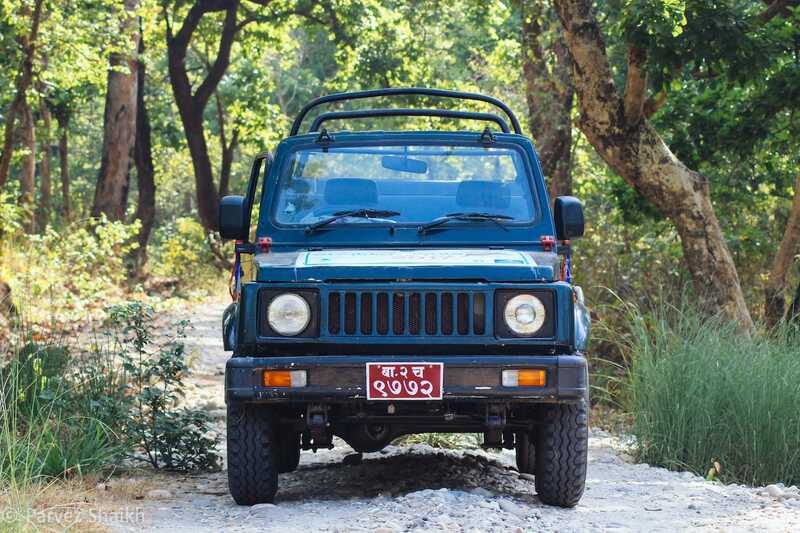 On my second day in Shuklaphanta, I was ready to go on a jeep safari at the national park. It was my first jungle safari experience and I was excited about it. I initially didn’t plan to go on a safari, but as I arrived a day earlier at Shuklaphanta Jungle Cottage, I thought of giving it a try. A documentary video they showed me about the national park also contributed to this decision. The Shuklaphanta National Park was previously a wildlife reserve and its status was recently changed to a national park this year. The park doesn’t see as many travelers as Bardia National Park or Chitwan National Park yet. Read my jungle safari experience at Shuklaphanta National Park, Nepal below and decide whether you should add it to your Nepal itinerary. Bishnu, the guy working there as a guide told me the previous night that we were supposed to leave around 6 in the morning. So I woke up early and got ready. We didn’t leave on the time we planned and it was around 7:15 when our driver started the Gypsy. Shuklaphanta National Park is just nearby from the cottage. We reached the gate of the park and I waited in the vehicle while Bishnu finished the formalities at the counter. Within 10 minutes we were ready to enter the park and a new experience was waiting for me. I had never really been in a jungle before, so the moment we entered the park, I started observing around. It was great to see all the greenery around me. With different birds keeping us company by singing and whistling, we slowly moved around in our car. Soon it was the time when we started spotting animals in the park. The first animal we got to see were, well, they were a group of cows. It was supposed to be a good sign because cows are considered holy. After the blessings of the cows, we moved ahead and spotted a bunch of monkeys. Almost all of them ran away before I could even point my camera towards them to snap a picture, expect one female monkey with her baby. She just waited for a while I quickly took a few photos before she disappeared in the trees, too. Along the way, we spotted a bunch of deer. Those deer were very sensitive to the sound of our vehicles and before we could stop to see them, almost all of them would run away. In addition, our driver was probably not good at hearing the guide when he would spot something at a distance and ask him to stop the car. He would just continue driving – scaring the animals away. After riding around the jungle for a while and spotting some wild friends in action, we stopped twice at watch towers to take our breakfast and lunch. Both the time, it was a beautiful view of the grassland around us. For breakfast, we had some tea and a pack of biscuits. In lunch, they brought us some fried rice, a pack of mango juice and water. We had our lunch, keeping an eye on the place for a possible animal passing by. We could see some deer at a distance through our binoculars. While wandering around the jungle, Bishnu and Anil led me to the India – Nepal border that passes through the Shuklaphanta National Park. 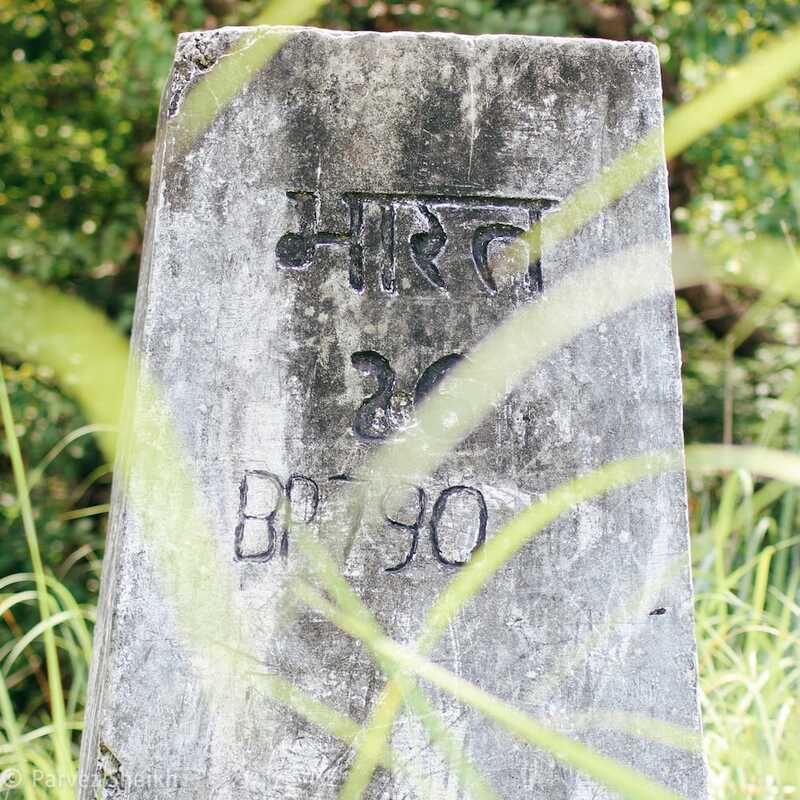 It was a stone with Nepal and India marked on their respective sides. They told me that if I went beyond the stone, I would be considered as entering in India. We just did that and within a few moments, we were back in Nepal. Bishnu suggested that we better leave as it wasn’t allowed to be near that area. And so we left in search of other animals. After spending a lot of time watching birds and some wild animals like boars, we camped at a watch tower. My guide told me that it was a common spot for rhinos and tigers to visit. On our way, Bishnu spotted fresh footprints of a tiger in the sand. He followed the footprints and they disappeared in the woods. He also showed me that a tiger had made a mark on a tree – marking his territory. 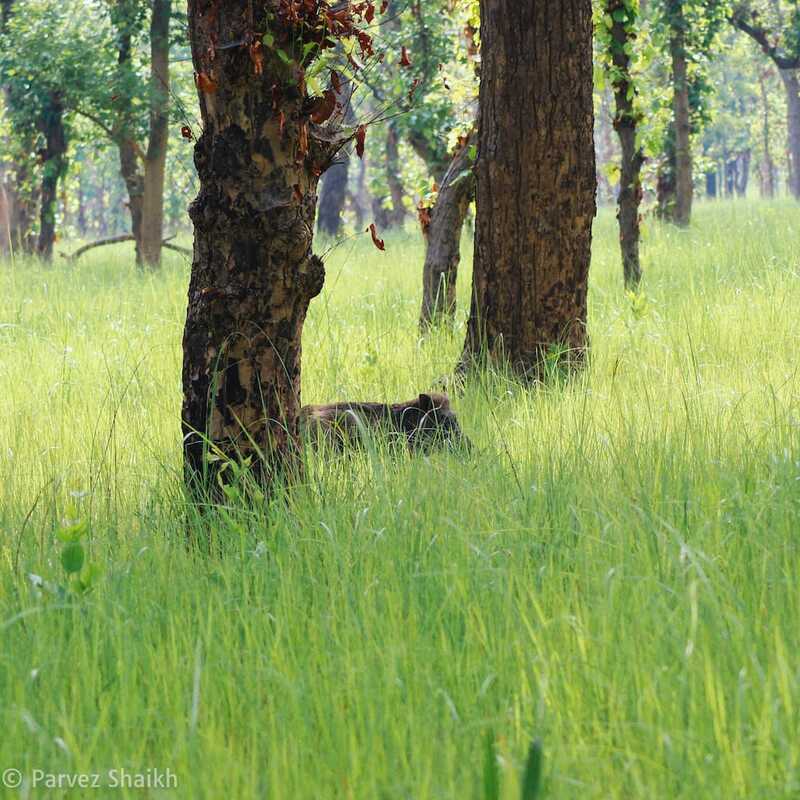 This got my hopes really high and I thought I would not leave without spotting a tiger today. But the tiger wasn’t in the mood yet, so we kept moving in the direction of the watchtower. After reaching the watchtower, I arranged my camera on a tripod and kept it ready to snap photos if we spotted something. I patiently kept looking in the direction of the lake where we could spot a tiger but for more than an hour, we had no luck. In the meantime, both my guide and driver took a nap and upon waking up, asked me whether I could spot something. In about an hour and a half, all I could spot was a bunch of curious monkeys and some birds. But a tiger was still out of sight. So they suggested that we go to another lake where we would ‘definitely’ spot some rhinos and possibly tigers, too. Just like at the watchtower, we waited patiently by the lakeside for a tiger or a rhino to make an appearance. But here too, we couldn’t spot any. As the time of was sunset getting near, we started moving towards the exit – without actually spotting what we expected. It was disappointed not to spot a single rhino or tiger, but we had our fun in the jungle. After riding in the jungle for a few minutes, we exited the Shuklaphanta National Park before sunrise. I believe it was our bad luck that we didn’t spot any tiger or rhino, but I believe Shuklaphanta National Park is quite overhyped about tigers and rhinos. I was told that it was pretty common to see a tiger at the park, so I had my hopes high. Overall, while we didn’t see any tiger or rhinos, my jungle safari experience at Shuklaphanta National Park, Nepal was amazing. As it was the first time I was doing a jungle safari, I observed and discovered a lot about the jungle. I also took many photos, and we moved around the national park throughout the day in search of a tiger. 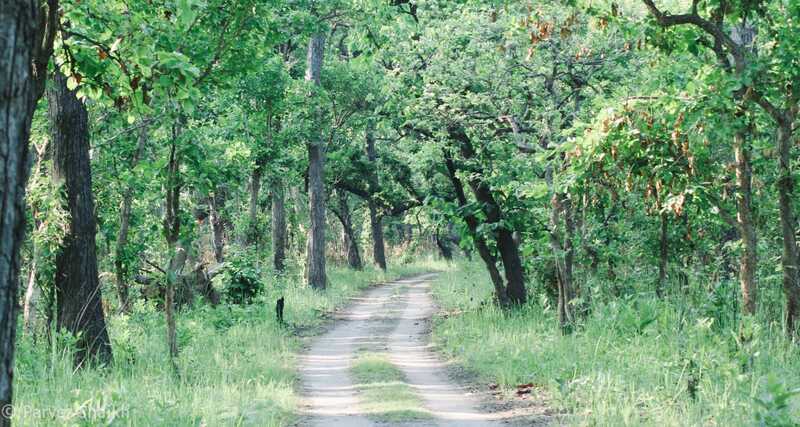 If you are entering Nepal from India via Banbassa – Bhimdutta border, you might want to add Shuklaphanta National Park in your itinerary. You might also want to spend a night or two here before you continue your journey. I won’t say that a jungle safari at Shuklaphanta National Park is a complete waste of time and money. 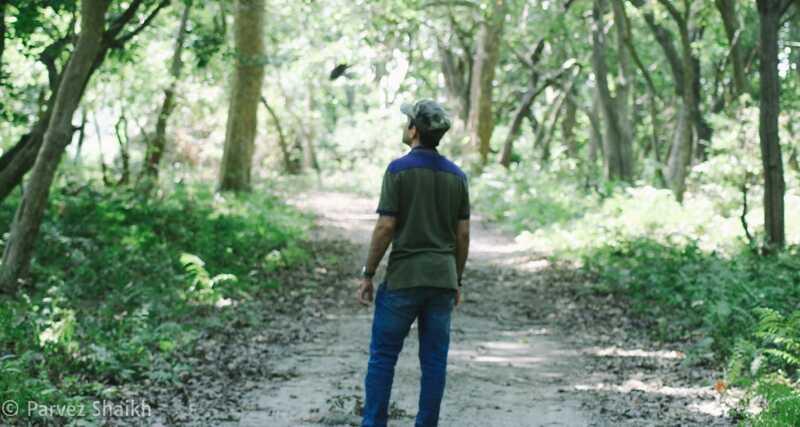 But I would suggest that you better do it at Bardia National Park – especially for tigers, or Chitwan National Park – which is home to about 650 rhinos. 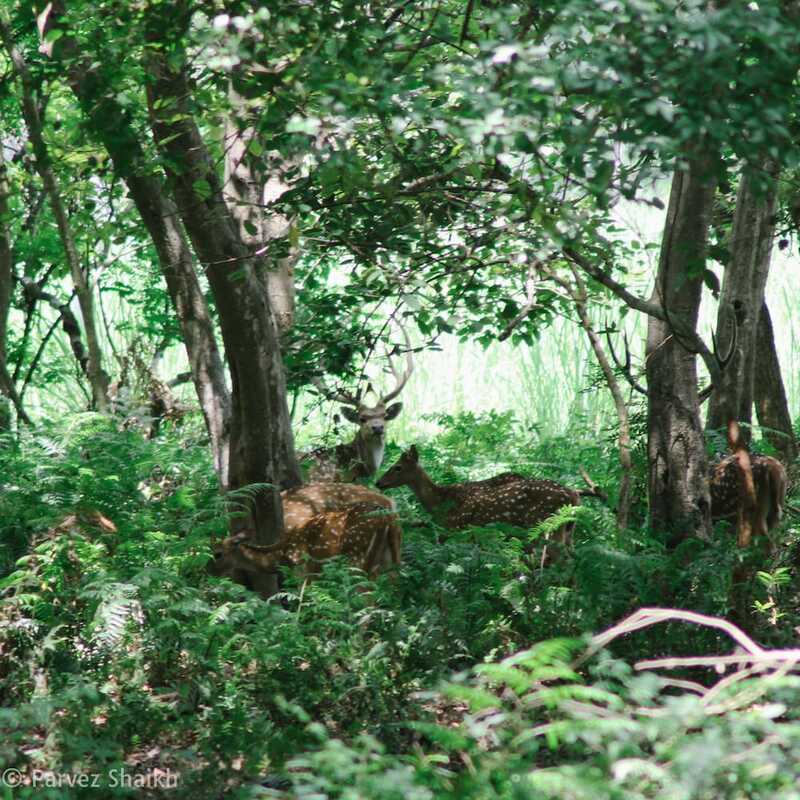 Did you go on a jungle safari at Shuklaphanta National Park? How was your experience? Do let me know. 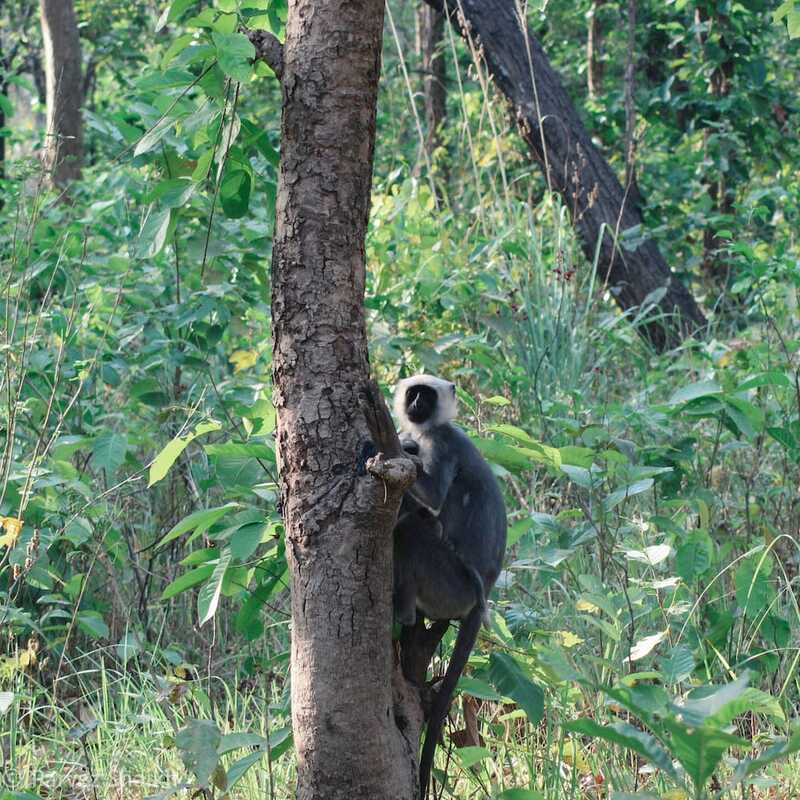 Planning to visit Shuklaphanta National Park? Book your stay with Shuklaphanta Jungle Cottage and arrange a jungle safari with them.